VeryPDF PDF Editor can be used to convert DWG file to PDF and allows you to edit content in converted PDF file. By this way, you can edit content of DWG file even if you do not have CAD applications installed. Meanwhile after editing, this software allows you add company logo, comments set password to protect the output. In the following part, I will show you how to make it. This software is GUI version, so you need to install it by double clicking the exe file and follow the installation message. This function is only available of the GUI Windows version of PDF Editor. If you need to use it under Mac, Linux or other platforms, please contact us as soon as possible. Please launch this software by double clicking the icon. And click the option File then go to Create PDF, and then go to From Any Printable Files. When you use this software, please install docPrint, which can help you print any printable file to PDF or image file. During the conversion, there will be MS Dos Windows showing up. Once the conversion finishes, the converted PDF file will be shown in the PDF Editor software interface. The following snapshot is from the software interface. PleaCse click the option of Edit Comment and then icons below it will go fresh. When you need to change the content in PDF file, please click the T icon. Then the mouse on the PDF will go to cross and simply draw an area around where you need to edit the content. There will be red frame showing up, simply right click it there will be dropdown list where is an option named Properties. Please click it then you will see menu option like I showed in the following snapshot. Here you can set font style, color, border color, opacity and others. In the General part, you can add basic information of the new layer. When you finish setting, please click button close to back to the main interface.Please double click the red frame then you can input the content that you need to input. When you finish changing, please do not forget to click option File to save the converted file as PDF or image file formats. 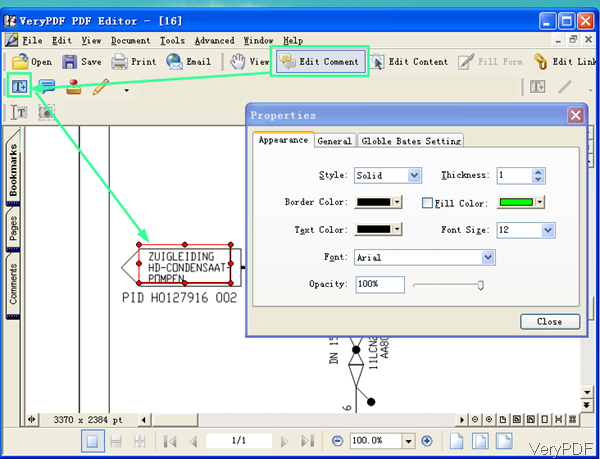 By this method, you can convert DWG file to PDF and change content in it. During the using, if you have any question, please contact us as soon as possible. How to copy a snapshot of PDF page to clipboard? How to add a textbox to pdf file by use of verypdf pdf editor? Can I add a paragraph-shaped comment to my pdf file? Create a PDF for iPhone and I need to resize PDF, how to? This entry was posted in PDF Editor and tagged dwg to pdf. Bookmark the permalink.